The Festival offers two full days of discovery and networking in the world of microlighting. Click the image above to download the detailed plan. Spread over more than 100 stands, exhibitors including microlight and paramotor manufacturers, engine builders, parts suppliers, magazines, flying schools and more. Certain exhibitors will be offering test flights to those interested. As the demonstration periods are limited, you should contact them directly in advance in order to guarantee your slot. As for last year, an area (Paramania) dedicated to Paramotor exhibitors has been created in the centre of the salon, with a zone designated for flight demonstrations by professionals only. Find a bargain, from the smallest part, to a complete microlight. A special area is reserved for the sale of second-hand parts and microlights. Expect to meet pilots, suppliers and supporters of microlighting from all over Europe. Suppliers from the east, pilots from the far north, everybody will be there. There will be a 500 square metre catering tent open from midday on Friday until after lunchtime on Sunday, providing breakfasts, lunches and dinners. Breakfast will be served from 7.30am. There will also be a bar serving cold drinks, snacks and sandwiches. Opening times; Friday 4 to 8 pm, Saturday 8 am to 8 pm and Sunday 8 am to 6 pm. A taxi service will be available to transport you to your hotel, B&B, campsite. Mobile-home style campsite (no tents), located only 10 minutes flying time from the Festival. A camping area will be provided close to the car park. Microlight pilots are also able to pitch their tents beside their machines in the microlight parking area. Temporary showers and toilets will be available. Due to restrictions applied by the local council, it is not possible to use the normal airfield entrance, the vehicle entrance will be clearly signposted via the village of Le Breuil. All microlights and GA aircraft flying in to the festival MUST be pre-registered. All microlights at the festival MUST carry public liability insurance whether arriving by air or by road. Proof of insurance must be provided to the organisers. Anyone unable to provide such proof will be required to purchase temporary cover at a cost of 25 Euros. The area to the North-East of the aerodrome and the tarmac runway 12/30 will be for the exclusive use of GA aircraft and helicopters, which MUST be pre-registered. The area to the South-West and the grass runways 12/30 will be for the exclusive use of microlights and paramotors, which MUST also be pre-registered. The grass runways will be split into arrival and departure sections and the centre point will be manned by the Flight Director or one of his officials. For microlights, the period between 08:00 and 14:00 on Saturday 1st September is reserved for experienced pilots with radio installed and operational. 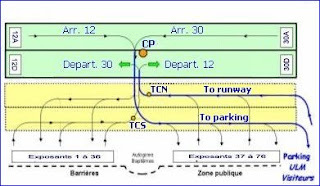 During this period the procedures for approach and traffic separation must be followed exactly, correct spacing maintained, visual contact assured and all radio communication must be EXCLUSIVELY IN FRENCH. In order to retain a certain freedom of movement and to accommodate the most traffic, arrivals and departures will be made without fixed radio procedures. The frequency 130.200 MHz will be used for the festival and demonstrations by exhibitors. However it is highly recommended to transmit as little as possible and only if absolutely necessary, but to thoroughly prepare your arrival and to keep a very good look out. An Automatic Traffic Information Service (ATIS) will be active on 127.350 MHz. All aircraft should monitor this frequency before arrival to obtain the latest information. It is imperative to respect the schedule regarding the hours when arrivals are allowed and the published procedures. Please note that during the period on Saturday evening reserved for slow flight, no other arrivals are allowed. The only period when the use of radio is obligatory is Saturday 08:30 to 14:00 local. The traffic density during this period does not allow for the use of a normal radio procedure. A good listening watch must be maintained and all pilots must be ready to execute any manoeuvres requested of them. Pilots should only transmit for reasons of flight safety and security. During this period ALL radio communications must be EXCLUSIVELY IN FRENCH ! Pilots arriving under a flight plan MUST close the flight plan on arrival. Every year the organisers waste time searching for pilots who have forgotten to close their flight plans. DO NOT enter the Prohibited area around the nuclear plant of Saint Laurent des Eaux. This is a Temporary Prohibited Zone. Incursions are liable to a fine between 15,000€ and 45,000€ and/or six months to one year prison sentence. 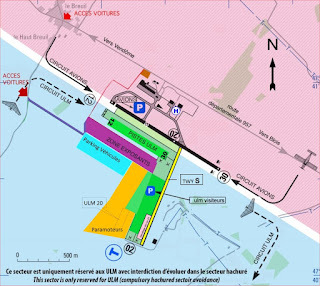 During the festival, for reasons of flight safety, the area to the North-East of the aerodrome (shaded pink below), as well as the tarmac runways 12/30, will be reserved for Group-A aircraft and helicopters. The area to the South-West (shaded blue below)and the grass runways 12/30 will be exclusively for Microlights. The water tower at Landes le Gaulois, the only one near the aerodrome (blue circle below) is an ideal landmark for joining the downwind leg at 600 ft AGL, however this should not become a dense concentration point, and a good lookout must be maintained at all times. Do not overfly the village of Landes le Gaulois. Microlights should enter the area from south west of the water tower, listen for information on 127.350MHz and then monitor the Microlight frequency 130.200 MHz; keep a good lookout; make gentle changes of speed, direction, slope and respect the traffic pattern. During the festival, Microlights should not use the aerodrome frequency 118.450MHz or the hard runway. In order to avoid unnecessary overhead passes, the runway in use will be indicated by a « T » which will be positioned close to the threshold of runway 02 and visible by passing well above the circuit height, before joining downwind. Remember that the top of the « T » indicates the direction to land. In the case of little or no wind, runway 12 will be preferred for arrivals. In order to maintain a uniform traffic pattern, Base Leg should be flown at 800m from the threshold. This can be judged by visually extending the grass runway by its own length. The runway line and the threshold are clearly marked by the displaced threshold markers. Base leg should be flown just west of the D138 road. Abeam the small wooded area, you should aim to be at about 300ft. The runway line and the threshold are also clearly marked by the displaced threshold markers. Finals for this runway should also be flown from 800m with an approach slope of 5 to 10%. Abeam the tarmac runway 30 threshold, you should aim to be at about 300ft. Particular attention must be paid to the traffic order and separation distances must be respected. An approach speed on final of 90kmh (50kts) should suit most pilots. For flight safety and security reasons, it is important to maintain a standard approach slope and a minimum separation of 400m between all aircraft. Remember to check your blind spots. Neither the tarmac runway nor the 100m strip between the tarmac runway and the festival are to be used by Microlights, except for reasons of flight safety. All pilots should make an effort to clear the runway as quickly as possible by the exit at the Centre Point (CP) and to follow the signs and flags towards the Microlight parking area. Any pilot unable to stop and turn off at the CP should continue to the far end of the runway,turn off and follow the directions of the marshals, DO NOT BACK-TRACK. Only exhibitors with valid badges will be permitted to taxi directly to their stands. Fuel will be available at the entrance to the Microlight parking area, from your arrival time onwards. Movements in the parking area will be on the east-west aligned paths and follow a one-way system. Anyone wishing to camp alongside their aircraft should park in the western half of the parking (outside the glider runway) Tent pegs must not be fixed anywhere on the existing glider runway. 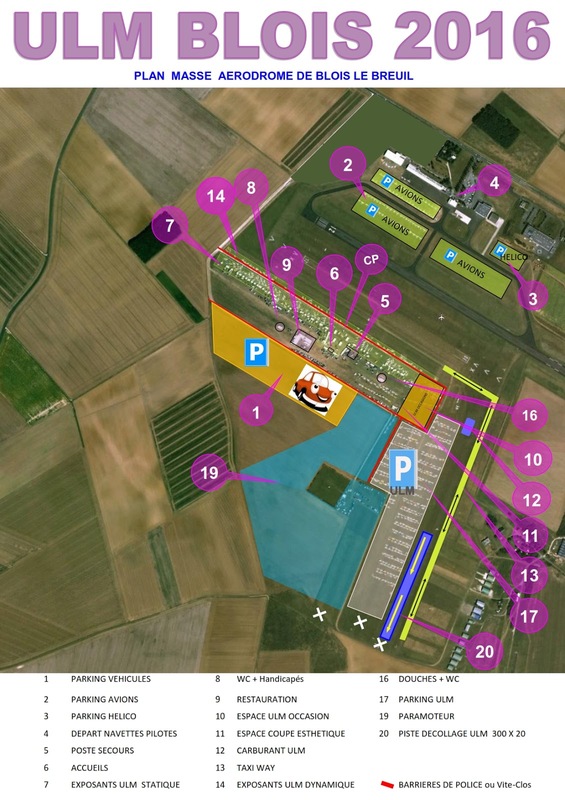 Those wishing to take part in the “Concours d’esthétique” should go to the area marked “Occasion” on the right and follow the marshals’ directions. Any Microlight wishing to use the hard runway must follow the procedures published for Group-A aircraft, park in their parking and will not have priority for registration. These periods are during the demonstration flights by exhibitors and marshals will direct departures. Departures from runway 20 will only be for Microlights which are departing the festival permanently, pilots wishing to make local flights and return to the festival must use runways 12/30. Taxi from the parking to the runway centre point CP along the north taxiway. On reaching the holding point TCN, indicate if you need to use the full runway for a 'long' departure. Otherwise follow the directions given to depart from the CP which will be manned by the flight director or one of his deputies. Immediately after takeoff, turn onto a heading of 150 degrees and climb to reach 1000ft as soon as possible. Remain highly vigilant as there will be dense traffic in the area of the aerodrome, the Paramotors should normally be operating to your right during the departure procedure. Once away from the airfield, resume normal flight rules. Registration wil open on 5th August and is obligatory for all pilots wanting to fly-in to Blois this year. 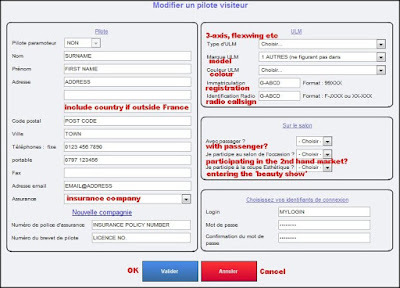 "Vous êtes pilote visiteur arrivant en vol". 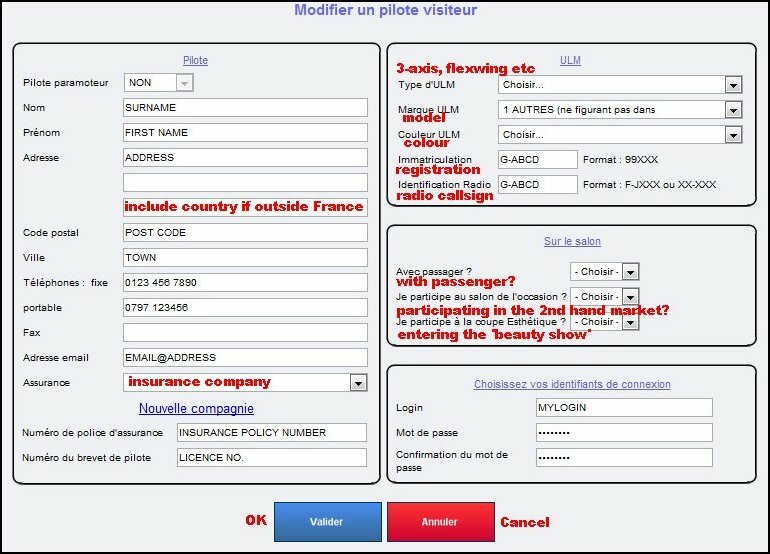 On the next page click the first box if you are arriving by Group-A airplane, the second box for microlights (not paramotor) or the third box for Paramotors. 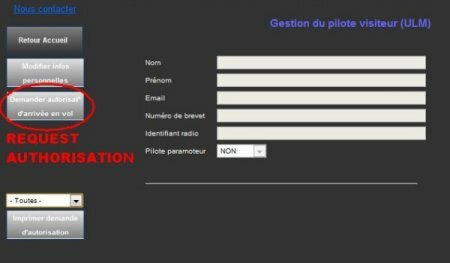 Note that you cannot enter the same information in the fields "Immatriculation" and "Identification Radio" as in the french microlight system they are different formats. What you need to do, is to enter 99 followed by your last three letters or digits in the first field, and change the format of the radio callsign to X-XXXX so the server will accept the information. E.g. Registration 99BCD, Radio G-ABCD. If your insurance company does not exist in the list, click "Nouvelle compagnie" and enter the name of your insurer. Once you've finished that, you can save your profile and reserve an arrival time. The days are split into (mostly) 30 minute blocks with 30 slots available in each block. 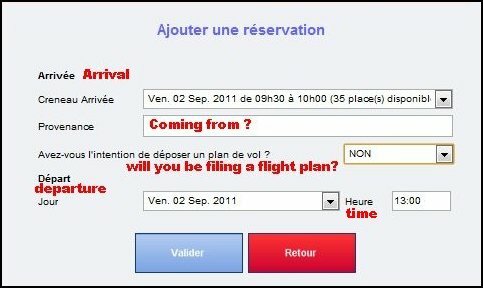 The reservation form is accessed by clicking the button on the left of your profile page. When you have filled out the reservation form, you will be emailed a confirmation. You MUST print the attachment and bring it with you, along with your proof of insurance. If anything else gives you difficulty, please leave a comment here and I'll try to help.